Brielle and her seven-and-three-quarter-years-old son, Brayden, came from North Carolina to DC to visit me! 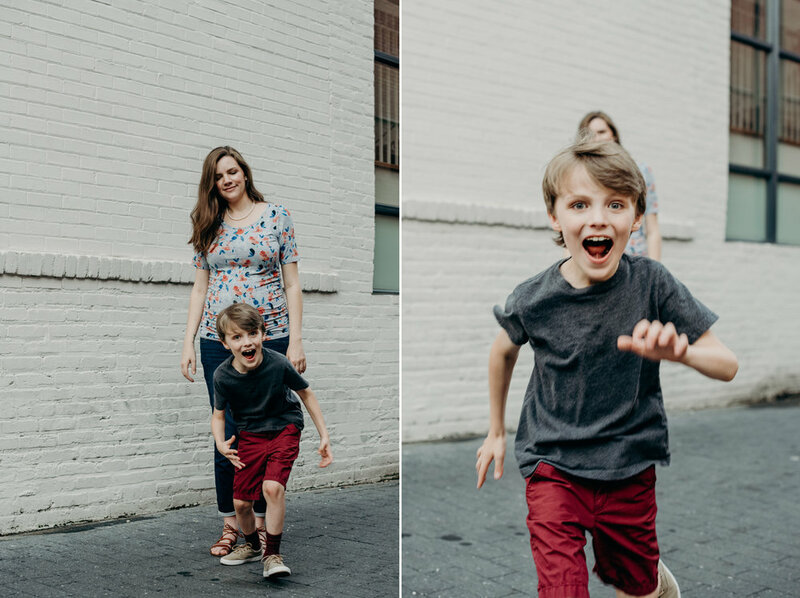 My sister wanted to capture some lifestyle photos just the two of them on a mother-son date before her new baby arrives in August, so we picked an ice cream shop they'd visited once before when I lived down on P Street! Brayden is such a handsome little guy, and my sister is absolutely glowing at 27 weeks pregnant. We're already planning her maternity portrait session for 36 weeks, and a newborn/ family lifestyle session soon after their little girl makes her entrance into the world! Don't be fooled by this kiddo's cuteness: he was all over the place, and crushed his ice cream cone within two seconds of holding it. BUT that's all totally okay because it's real, authentic, and beautiful! We absolutely love lifestyle family photography sessions. We love the connection and emotion they evoke, and find it's so much easier to capture an authentic smile when you're doing something you love with the people that you love! If you're interested in a DC family or couples lifestyle session, contact us for details! We're now booking for summer and fall 2018.